Gallery of emotions for correc cosmetic make-up. It is necessary to see correct emotional expression of a female face, namely it is necessary to identify original emotions to create correct cosmetic make-up, and then facial image of a woman will seem natural that in any case looks beautifully even if physiognomy is sad. The quiet mouth seems outspoken as eyes and eyebrows express open emotions. The open eyes and eyebrows seem covert as mouth expresses quiet emotions. The person realizes arising desires, but feelings do not speak anything. The person denies feelings, but desires and ideas aspire in world around. 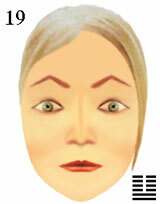 original emotions of a female face for correct cosmetic make-up.